1st Choice Restoration has three convenient locations to serve you. A professional restoration service, we have years of experience in fire, water and wind damage restoration. Eastern Washington, Northeastern Oregon and surrounding areas have the restoration experts close by for quality service whenever it's needed! We have emergency services that can be at your door within minutes. 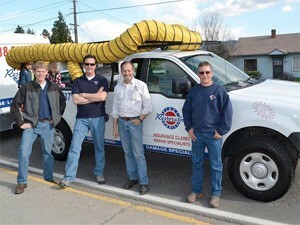 Services include fire damage, board up, wind damage, water damage and sewer remediation. 1st Choice Restoration, Inc., is a full-service restoration company dedicated to handling jobs of all types and sizes. We use only the newest, most innovative techniques to ensure that your loss is repaired quickly and efficiently. We offer fire, water, and mold damage restoration services as well as sewer backup and remediation. We also offer 24 hour emergency service and can be on site within 1 hour. Our technicians undergo in-house training outlined by IICRC (Institute of Inspection, Cleaning and Restoration Certification) in mold, water and fire remediation. Here at 1st Choice Restoration, we make sure you get the highest quality of service available so you are satisfied with not only the results, but also the choice you made to use 1st Choice Restoration, Inc. for your reconstruction and restoration needs. EVERY DISASTER IS A UNIQUE CHALLENGE, WHICH WE MANAGE QUICKLY AND PROFESSIONALLY, SO THAT YOU CAN GET BACK INTO YOUR HOME OR BUSINESS AS SOON AS POSSIBLE, WITH COMPLETE RECOVERY. CALL TODAY TO SCHEDULE A ON SITE CONSULTATION. Every disaster is a unique challenge, which we manage quickly and professionally, so that you can get back into your home or business as soon as possible, with complete recovery.